"On days when my schedule is overloaded, this easy throw-together recipe is always a hit with my family." 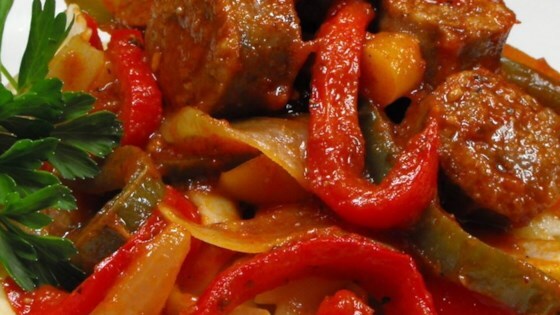 Place the sweet and hot sausages, green and red peppers, onion, and pasta sauce in a slow cooker. Add about 1/2 a jar of water. Cook on Low for 6 to 8 hours, or on High for 3 to 4 hours. Fill a large pot with lightly salted water and bring to a rolling boil over high heat. Once the water is boiling, stir in the macaroni, and return to a boil. Cook the pasta uncovered, stirring occasionally, until cooked through but still firm, about 8 minutes. Drain well. Slice the cooked sausages, then return to the slow cooker. Allow to rest for 10 minutes before serving the sausage, peppers, and onion over the macaroni. Fatal flaw for me: this cooked up so greasy it was impossible to eat. I put in uncooked sausages, and when it was done cooking, the sauce was just a greasy mess. This is so good. I made extra for subs later in the week. I will use this recipe in my monthly rotation. Thanks for sharing the recipe,I can use all the help that I can get.